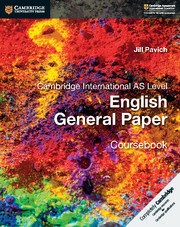 The only endorsed resources for the Cambridge International AS Level English General Paper syllabus (8021). With ready-made lesson plans, worksheets and a scheme of work all written by an experienced teacher trainer, this Cambridge Elevate Teacher’s Resource helps you save time preparing and planning. 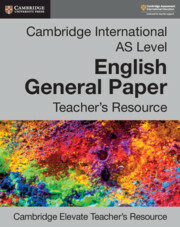 Combining a logical route through the syllabus with editable PowerPoints, advice for differentiation and tips for tailoring the material to your classroom, this resource is an essential addition to any English General Paper teacher's shelf. Answers to coursebook questions are included in this resource. If you wish to buy this resource, we will email you a book code - please contact your sales consultant or customer services. Supports group 4 of the Cambridge AICE Diploma. Your digital teacher's resource gives you access to materials to plan your teaching. Choose from PowerPoints, worksheets and lesson plans to help save preparation time. Provides a scheme of work and practical advice for teachers new to the course or looking for new ways to approach it. Practical classroom ideas help you to add relevant, inspiring current affairs discussion topics and materials to your lessons. Advice for differentiation helps you tailor lessons to your students’ individual needs. Includes essay-marking guidance that shows points to look for in students’ answers.